200 years that changed the world – Gapminder.org – DATA Visualization! Data visualization is so powerful. 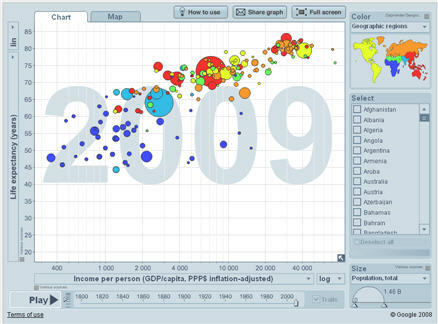 At http://www.gapminder.org they have taken over 400 tables of data from reputable sources (e.g., ILO, WHO, UN) collected over spans of years and dynamically graphed them to show parts of the world (poor, middle, and wealthy, etc.) and allow a time lapse view of the changes. It’s incredible! Watch this one first. Hans Rosling explains the process. Fabulous teaching tool. Here are more examples. Note the categories of the two axes and the play button which will display the period of time the data covers from oldest to most current (usually around 2008 for the latest data). I find you can also manually (and slowly) go through the visualization, mousing over the various circles to identify each country as it moves. In the top menu, click on DATA to see all the different charts and tables available. You also can search on a particular facet. Lots of presentations to download, TED talks by Hans Rosling, and help for instruction. I believe students will understand the big issues presented in this manner. Let me know if you have used them or use them in the future or find a particularly effective visualization which makes a global view and understanding more apparent to your students.